CRAWFORDSVILLE, Ind. –- No. 7 ranked Mount Union had eight wrestlers place and finished third as a team at the NCAA Central Regional at Wabash College. No. 1 Jordin James (Bedford), No. 6 Antwon Pugh (Fairlawn/Copley) and No. 2 Jairod James were all dubbed regional champions at 133, 157 and 174 pounds. With a second place finish was No. 10 Luke Hernandez (Nashport/Tri-Valley) in the 149 pound weight class. All four wrestlers have qualified for the 2019 NCAA Division III National Championships that will be taking place March 8-9 at the Berglund Center in Roanoke, Va.
At 165 pounds, sophomore Michael McIntire (Wadsworth/St. Vincent-St.Mary) fell in the consolation final that would have sent him to the national tournament for a fourth place finish. 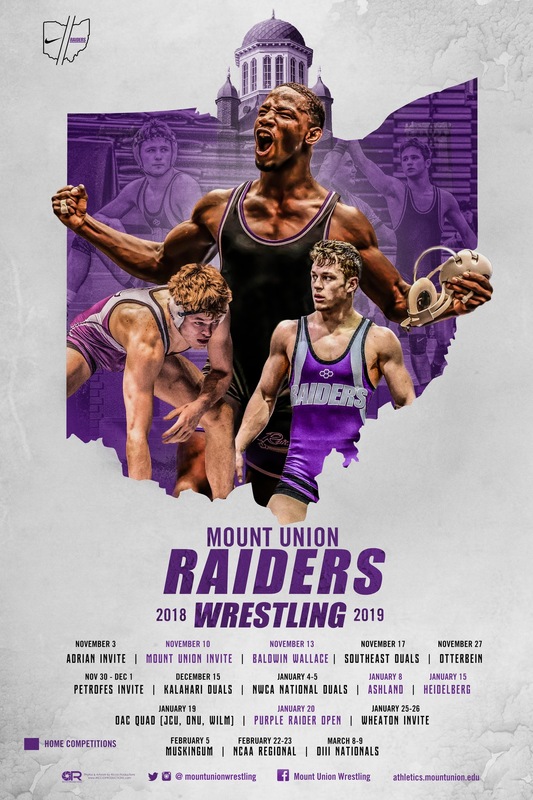 Sophomore 125-pounder Nolan Wochna (Brecksville-Broadview Heights) along with the freshman duo of 141-pounder David Massey (Cuyahoga Falls/Woodridge) and 197-pounder Landon Talbert (Salem/Crestview) wrapped up the placers for Mount Union each taking fifth. As a team, the Purple Raiders tallied 144 total points which was 2.5 points behind second place and No. 5 ranked Baldwin Wallace (146.5) and 12.5 points behind region champ and No. 4 ranked Wabash (Ind. ).